VERY FINE. AN IMMENSELY RARE AND POSSIBLY UNIQUE COMBINATION OF ERRORS. This combination is not listed in the catalogues and we are not aware of any other example. 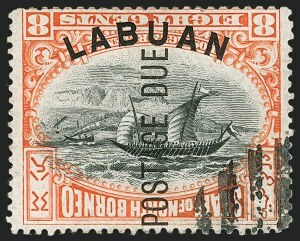 The character missing variety occurs on only one position in the pane and only a few panes were produced with the double surcharge. FINE. 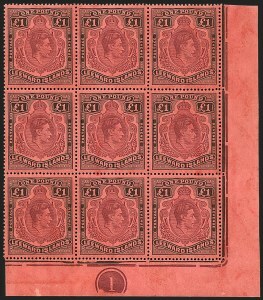 AN IMPORTANT AND SELDOM-OFFERED BRITISH COMMONWEALTH RARITY, OF WHICH ONLY ABOUT 30 EXAMPLES ARE RECORDED. 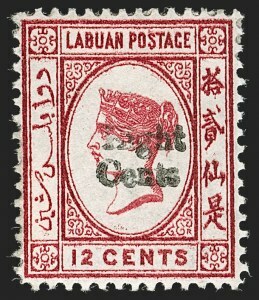 All of the known examples of this invert are cancelled to order, as they were discovered in packets after having been "remaindered," cancelled and sold below face value.